I was not expecting to love this book as much as I did. I first fell in love with Denise Hunter’s novels when I read Sweetwater Gap. I never forget a book I truly enjoy, and I will not be forgetting this lovely read. 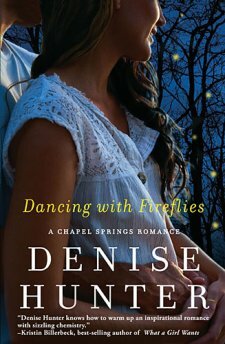 In Dancing with Fireflies, Jade Mckinley finds herself in a heartbreaking situation. She is forced by her circumstances to return to her home town and family. When she arrives home she finds her greatest help in a family friend, Daniel Dawson. What Jade doesn’t know is the love Daniel has had for Jade for many years. Daniel comes to Jade’s aid in so many ways. I cheered for them, I hoped for them, and I even cried a little! Denise Hunter did a magnificent job weaving together this truly delightful love story. Once I began reading, I was anxious to keep reading. I forfeited sleep for this one! I recommend this book to anyone who loves a good, memorable, read it again and again love story. I was given a free copy of this book by BookLook Bloggers in exchange for an honest review. I have received no compensation other than the joy of a great read. All opinions are my own.